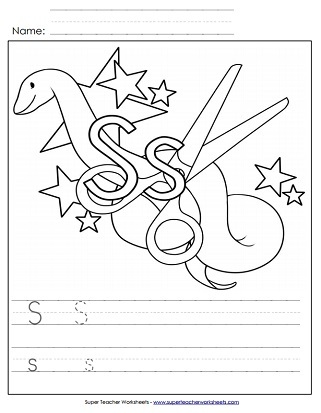 Practice writing upper and lower-case S on the lines provided and then color in the pictures of the snake, stars, and scissors. Color in the pictures and practice writing S s on the lines before assembling and wearing this headband. Learn to properly write lower-case s by tracing the dotted lines with a pencil. Trace the gray lines on this worksheet to practice writing lower-case s.
Writing capital letter S is easy to do with this printable worksheet! 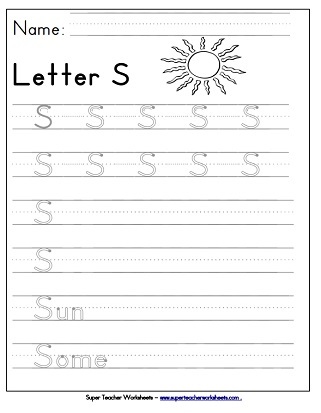 Another worksheet to practice writing capital letter S.
Find the S s, then write S s, write words that start with s, and then draw a picture of something that starts with S s.
Print this worksheet to practice letter recognition. Dot the circles with colorful bingo dabbers.